It’s a new year and instead of all the usual resolutions, cleanses and promises we have simply decided that 2018 is going to be the year that we slay weekend meal prepping. We are talking Sunday evening batch cooking, roasting, peeling and jaring – grandma style – here. We have previously been half-doing this with a more random batch cooking approach (which you can read more about in the first chapter of Green Kitchen at Home). But we’re stepping things up now. Life with three kids is stressful as it is and this method helps us to eat well during the week, save time and be more spontanious. It also helps us avoiding those hangry (hungry/angry) kid-situations. We have only been doing this properly for the past months now but thought we’d start sharing the basics right away, in case you guys want to start doing this along with us. Food prepping is a simple method and surely many of you already know the basics. The idea is that it is a lot easier to cook and eat real food during the week if you prepare and cook some of the ingredients on the weekend before. Less prepping during the week also means fewer bowls, boards and knives to clean up. So we focus on things that can stay fresh in the fridge during the week and can be used in a number of different meals. Some things are cooked or roasted and other are simply peeled, rinsed or chopped. And we also make one or two sauces/dips/dressing that we can use for our grains and salads. Many of the things we mention will seem super basic (like peeling a carrot), but it does actually make a huge difference to have those ready when the kids come asking and you are busy doing something else. We promise that you and your family will eat four times more carrots with this method. Thank us later. 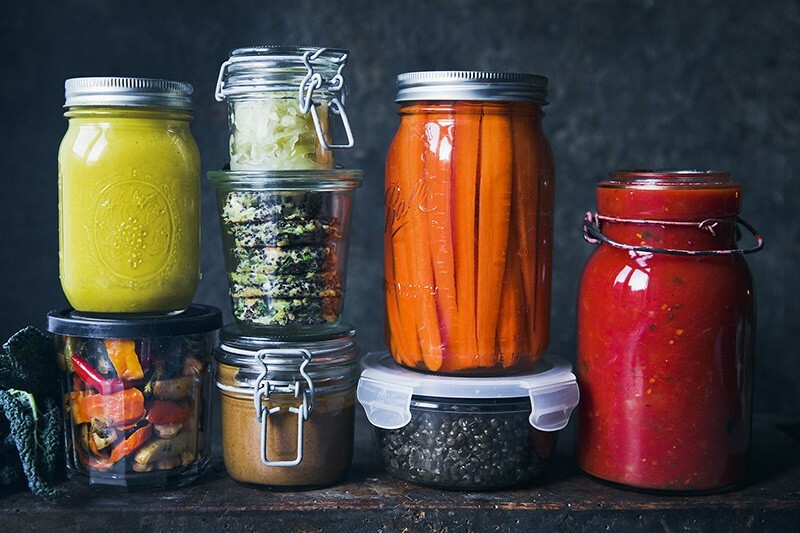 Before you start you might want top invest in a couple of transparent glass containers and jars (we use Ball jars, Weck jars and a few other jars). They will give you a good visual overlook of what you’ve got in the fridge while also storing the food in the freshest possible way. Make sure they can be stacked easily so they don’t take up too much space in your fridge and pantry. You can use marking tape if you want to keep track of how old your food is, but it’s usually easiest to just look, smell and taste. As we are still rookies on this, we are not doing full on meal planning yet. We don’t have an exact plan what dishes we’ll be eating for lunch and dinner throughout the week. 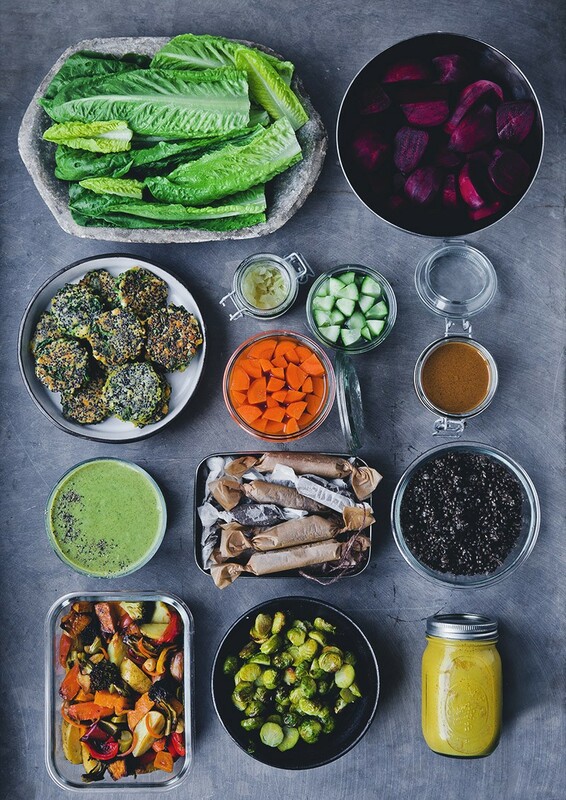 What we instead focus on at this point is providing lots of good options by having a mix of cooked and raw ingredients, sauces, leftovers and snacks. 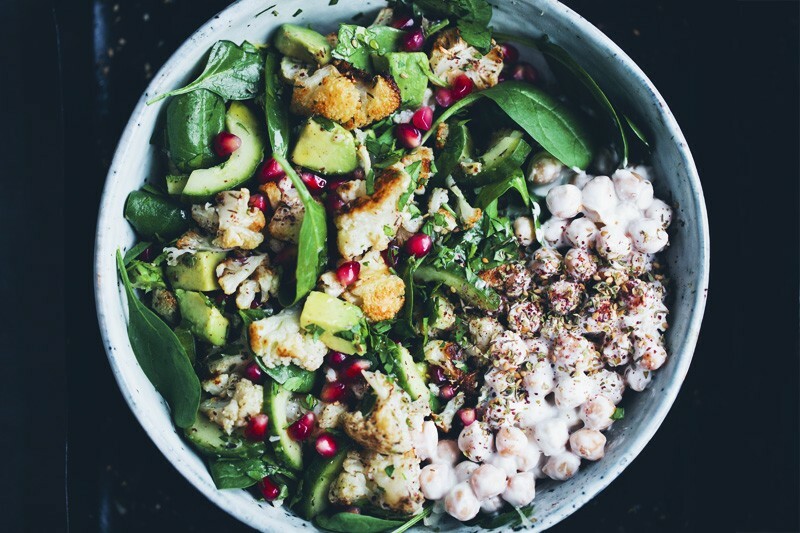 Many days we simply combine cooked grains, roasted vegetables, raw vegetables and fruit in a bowl, drizzle with one of the sauces and top with some toasted seeds (like the bowl in the image further down). It’s a good everyday lunch bowl or box that can be varied endlessly depending on seasons and what grains/lentils/sauce you have prepped. As for the kids, they usually prefer their roasted vegetables served individually with the sauce, grains, chickpeas on the side. So simply not as mixed. And if we have prepared a tomato sauce, we might use it for a baked pasta dish one day and inside an enchilada another day. Just to give you an idea. We are not focusing too much on the final dishes in this blog post but will share more ideas later. There are also many recipes in Green Kitchen at Home that can be matched with these preps. So take a breath and scroll through this list of suggestions what to prep and recipe links. Obviously we don’t prep all of these in the same week. If you are new to this, take one hour in the coming weekend and prepare one sauce, one container with cooked grains, beans or lentils, one tray of roasted veggies and a large jar of peeled carrots in water to start with. It’s of course also allowed to take shortcuts and buy a pesto, hummus or whatever else you might need to make your weekdays easier. One step at the time. – We peel or scrub carrots and cut them into sticks that we store in jars with water in the fridge. It’s the easiest snack when our kids say that they are hungry but dinner isn’t ready. We store them in water so they don’t dry out in the fridge. The deluxe version is to dip them in a jar of hummus or nut butter. Nom nom! We also rinse and chop cucumber or bell pepper in bite size sticks that we store in the same way. – Peeling beetroot means getting your hands tainted purple. Unless you were gloves. So it’s easy to skip them. Therefore we peel a whole batch while our hands are already tainted and then cut them into smaller bits. That way we can put them on a tray and roast in the oven with a drizzle of oil and salt even when time is short. Or toss in our juicer for a quick beetroot, apple & lemon juice. It makes juicing so much easier when the beetroots are already peeled and cut in a size that fits the juicer. – Rinse, chop off thick stems and store wrapped in a towel in the fridge for quick salads and bowls. – Quinoa, rice, millet and black lentils can all be cooked ahead and used in stir-fries, patties, salads, soup toppings or desserts. Just follow the cooking instructions (you rather want to cook 1 minute too little than 1 minute too long), let cool and store in sealed glass containers in the fridge. – Chickpeas and other beans are great in salads, for hummus and other spreads, burgers, falafels, soup toppings etc. Soak and pre-cook dried pulses and keep in glass containers in the fridge. Or buy them precooked and just rinse and put them in a glass container. We make varieties of quinoa or rice patties whenever we have some quinoa or rice left towards the end of the week. They last well in the fridge and can shine up any dinner or lunch. Store them stacked in glass jars in the fridge and simply heat for a few minutes in a pan or the oven before serving. Here is a link to our Spinach & Quinoa Pattie recipe! – It’s very easy to make a large portion soup so we often try to make soup on the weekend and keep the leftover soup ready in the fridge for lunch (with lots of toppings). Some days the soup can also become a sauce for pasta or rice. Last week it was a version of this Carrot & Lentil Soup (with the addition of orange juice) and this week we made the Broccoli, Mint & Pea Soup from Green Kitchen at Home. Check out our soup archive for more inspo. 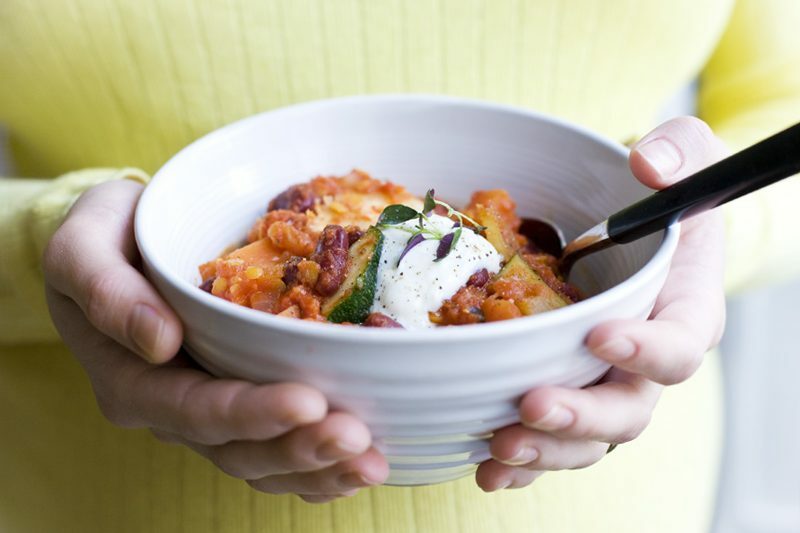 – One of our favorite dinners and the leftovers store well in the fridge. Just make double trays and have the leftovers for lunch. 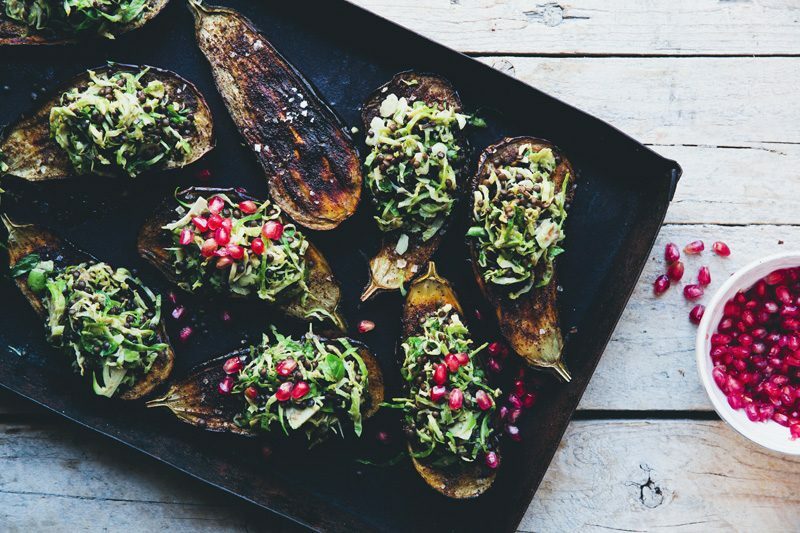 – Break into florets (cut brussels sprouts in half), drizzle with oil and bake at 200°C / 400°F for 20 minutes or until golden. We use these in salads, lunch bowls and stir fries. They are also one of our kids favorite food, just slightly reheated without any sauces or anything. Store in glass containers in the fridge. – Cut into bite-size dices, fries or coins. Drizzle with oil and bake at 200°C / 400°F for 25 minutes. You can mix roasted roots into hummus for a great flavor twist. Or put them inside warm sandwiches. Or simply add them to salads. We often eat them cold but you can also reheat them a few minutes in an oven. – Slice them into thin rounds, brush with oil, place on a baking tray and roast at 200°C for 10-15 minutes or until charred towards the edges. Place in a container, drizzle some extra oil, add 1 garlic clove and leave to marinate in the fridge. A great topping on soup or addition to any salad. – This is one of our favorite sauces currently. We literally drizzle it on top of everything. Salads, quinoa, kale, egg or sandwiches. Simply add all ingredients to a blender and mix on high until smooth and frothy. Taste and adjust flavours to your liking. Pour the golden sauce into a jar with an airtight lid. Store in the fridge, keeps up to a week. – Making homemade nut butter is not only easy but if you mix the nuts with 50% sunflower seeds it’s also a lot cheaper. We are obsessed with nut butters and use it on top of morning porridge, yogurt, sandwiches and desserts. It’s also great paired with fresh veggie sticks, apples and dates. Here is a link to our homemade nut and seed butter recipe. – Always have a jar of hummus in the fridge. Make it from scratch or buy the best version you can find. – Any pesto is a life-saver when it comes to adding more flavour to a dish, but if you haven’t tried this Magic Green Sauce, give it a go! – We are devoted sauerkraut eaters and makers and have 3 wild fermented sauerkraut recipes in Green Kitchen at Home, try the Golden sauerkraut here. If you don’t dare making your own just yet, buy a good quality one at the supermarket or health food store. – Bars or energy balls are our lifesavers when we need a quick sweet snack or post-workout treat. We change the recipe all the time. Our Mint Chocolate Power Bars, Nut, Quinoa Bars and Hemp Protein Bars are three good recipes to start with. We have started making them slightly smaller and wrapping them in baking paper so they look like caramels. They last longer, are more portable and cute! – These almond based muffins are only sweetened with dates and banana and a great little treat when you need an energy kick. Make a double batch and store one bag in the fridge and another in the freezer. – We make this flour-free Nut & Seed Bread as an alternative to our usual rye bread. We always make two of these loaves at the same time so they will last longer. One slice is very filling and satisfies cravings and blood-sugar spikes. – We prep a large batch of chia pudding that we store in large jar. It’s an easy breakfast, dessert, mid-day snack or porridge topping. – The most frequent overnight oats recipe we make is the one with orange & vanilla. 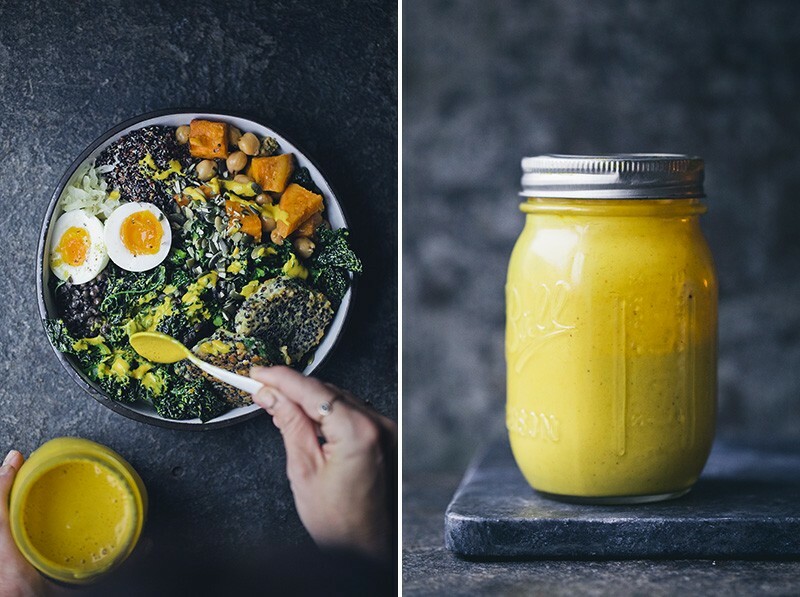 We use half orange juice and have plant milk to soak and make a large batch and store in the small jars, just grab a portioned jar in the morning and breakfast is served. – You can of course buy a granola if you like to save some time but it’s easy to make and perfect if you want to clean out your pantry from the last bits and pieces of seeds, grains, nuts and dried fruit. We have many granola recipes in our books but this Banana Granola is also a popular one. Sometimes we also make a Savory Granola that is great on top of salads and soups. Hope you liked this! If you want more ideas what to do with your prepped ingredients, check out our instagrams (gkstories | luisegreenkitchenstories) as we’re sharing more daily salad bowls, soups and meals there. Do you meal prep at home? 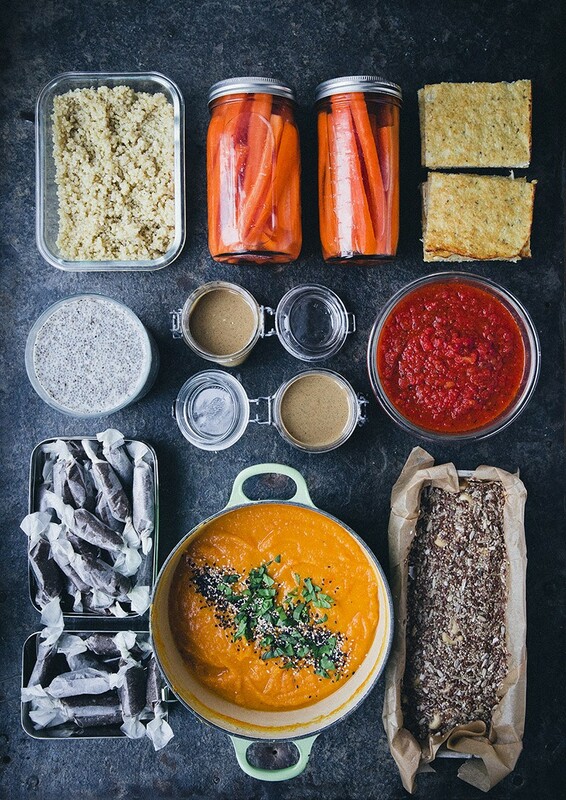 We’d love to know all your meal prepping tips and tricks . Please leave a comment and share! My best meal prep experience has come from having a meal swap club with five friends. We each cool a huge batch of something - generally something that is freezable (e.g. 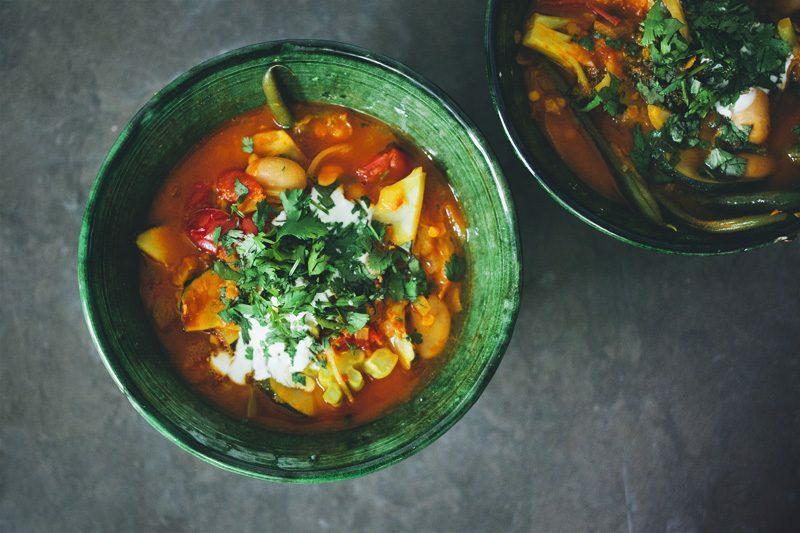 Soup, curries, a tagine). Then divide into five and pack into storage containers. We meet for a cup of tea which doubles as a nice social catch-up, and swap our meals. So we then go home with five different meals. It has been great as it means we are organised but with much more variety and it is great to have dishes we wouldn't normally cook ourselves. We meet once per month which worked well for our group. We self selected our group (all people who were into food and reasonable cooks) and then had few guidelines based on needs (e.g. Vegetarian dishes only, no peanuts). Such great suggestions in the post and some of the comments! My life changing tip is to pressure cook batches of beans- garbanzos, black beans, red beans, etc. and freeze them. They defrost quickly and it saves so much time and eliminates food waste. I should have added, you can defrost only what you need for your recipe and continue to store the rest in the freezer. We do this too! I love our pressure cooker. Buying dried beans and chickpeas in bulk is so much cheaper than cans, and you don't have to deal with rinsing and recycling all the cans afterwards either. I love that I can prepare enough hummus for the entire nation for about £2. Great ideas! We are a bunch of people at home and we all bring lunchs to work/school. So on Sunday I make sure that we have a lot of «ingredients» ready in the fridge. I prepare a big batch of rice/quinoa/pasta (for hot or cold lunchs (pasta salad, rice salad, etc.). I also prepare about two kinds of sauce (usually peanut sauce, tahini sauce, pesto, hummus). I also prepare snacks (granola, muffins, energy bars, dried pineapples or apples, etc. ), and a batch of roasted vegetables (aubergine, potatoes, tomatoes, etc. ), for any kind of meals. That's a great way to find some time to relax after the kids are in bed. Many thanks for the new ideas! Thanks for the motivation! I'll definitely try to do this. One question: how long can cooked rice keep in the fridge? Thanks! Thank you SO much for this. Just shared it with a bunch of my girlfriends and we're thinking of sorting this out together. This is so helpful. Thank you! I have only just realized how delicious sauerkraut is. Can you recommend some vegetarian things to add it to? What a wonderfull post, thank you! You are geniuses! Organization is the key to survival with kids in the house, especially when it comes down to food. Thanks for sharing this post! Haha, I just realised that I am not the only one who thought the turmeric is missing. Never mind! This was such a beautiful and helpful post, thank you! I do not do weekend meal prep yet, but I found that having the same "themed" dinner each night (mon - some sort of pasta, tuesday - some sort of salad, etc.) has helped a lot with the exhaustion that always comes from being so indecisive! Oh, no. It‘s not. Im just tired and old! Thank you so much for all the inspiration!! I have one question though: I am somewhat hesitant to keep cooked foods for too long, i.e. cooked grains or veggies. How long do you keep yours usually? I‘m rather on the anxious side when it comes to spoilage bacteria x) and never keep such things longer than ~three days.. what makes a full week prep rather difficult!